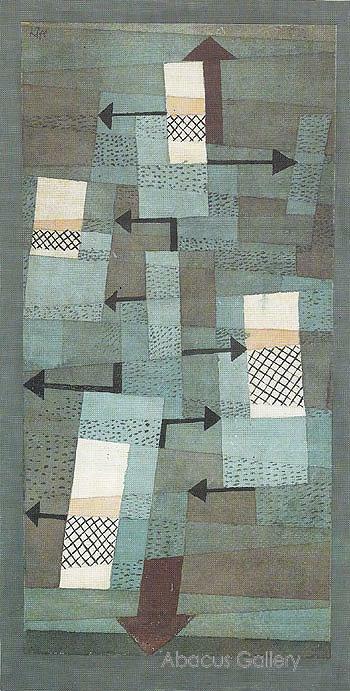 The Swiss-German painter Paul Klee’s fascination with balance has struck me as a valuable metaphorical tool. The 1922 oil painting, Wavering Balance (left), is a series of five rectangles all just slightly leaning to the left or the right. The arrows – like an arm thrown out to one side to catch oneself from a slip – try to gently right the shapes. Though the shapes themselves are out of balance, the painting as a whole somehow stands strong. In-depth analyses aside, I am interested in the tenuousness the painting evokes. There is something about a good play that is always just a little out of balance. At times, it is standing strong and tall, with clear intentions. Other times, it topples over leaving a pile of rubble to sift through. Most often, however, a performance ought to be just a little out of synch. For me, the most interesting characters are ones who attempt good (because people are inherently just and good), but who can never get the equation right. The inevitability of the slightest human flaw throws the entire character and play just out of balance. We can throw arms out to the side, wear heavy boots, tie a string from the top of our heads to the ceiling, but we’ll never stand perfectly in balance for more than an accidental second. An interesting character is one who when the audience is just beginning to believe is making the right decisions, makes the wrong one and falls flat on their face only to stagger to its feet again and repeat. I will try, as any human naturally does, to stay in balance. However, I will not blame myself for toppling over again. Imbalance is a law of existence as well as a law of physics.